Roy B ADAMS was born on April 04, 1924. He was the son of Charles S and Phoebe ADAMS. He was inducted in the Army on April 7, 1943 at Philadelphia, PA. He received ASN 33598882 and was assigned to the HQ Company / 194th GIR as anti-tank gunner. He was killed in action on January 4, 1945 in the area of Rechimont, Hubermont, Renuamont. His body returned stateside and he is now permanently buried at Pennsburg United Church of Christ Cemetery, Pennsburg, Montgomery County, Pennsylvania. Richard R MOWREY was born on September 13, 1924 at Nanty-Glo, Cambria County, Pennsylvania. He was the son of William H and Ida S MOWREY. He entered service on March 30, 1943 at Allentown, PA and received ASN 33621815. He was then sent at Camp MacKall, NC and assigned to C/194th GIR. He was killed in action on March 24, 1945 in Germany. His body returned stateside and he is now permanently buried at the New Jerusalem Cemetery, Leithsville, Northampton County, Pennsylvania. James E BUCY was the only son of Mr Earl Brown BUCY and Mrs Sarah C TURNER BUCY. He was born on November 30, 1924 in Maryland. Graduated of Fort Hill High School in 1942, he lived in Allegany County when he was enlisted on April 09, 1943 at Baltimore, Maryland. He received ASN 33720308 and was immediately send at Camp MacKall, NC where he was assigned to Company F / 194th GIR / 17th AB. 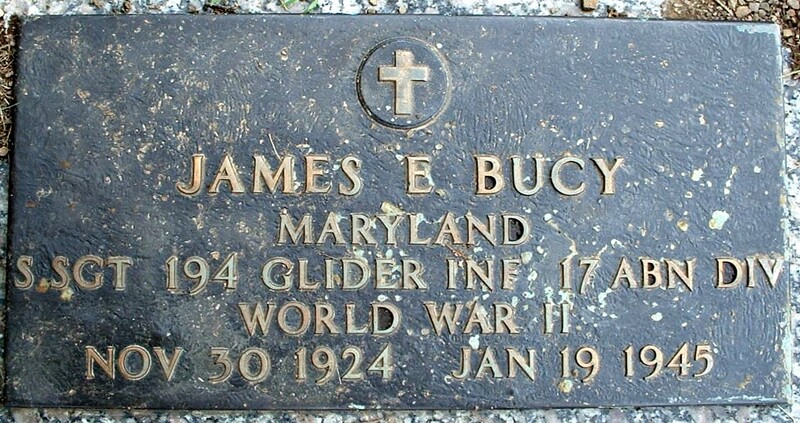 James E BUCY was killed in action on January 19, 1945 during the Battle of the Bulge. He had 20 years-old. 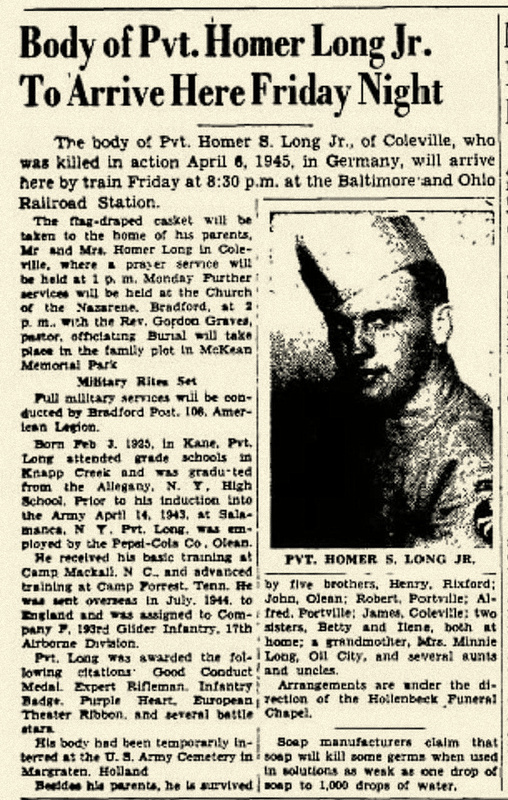 His body returned stateside in late 1948 and he was than permanently buried at Hill Crest Memorial Park, Cumberland, Allegany County, Maryland. 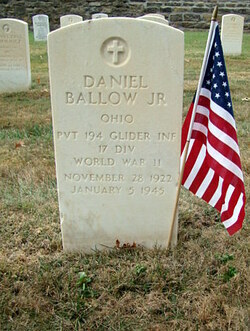 Son of Mr Daniel BALLOW and Mrs Anna Mindeck, Daniel BALLOW Jr was born on November 28, 1922 in Maple Heights, Ohio. Daniel was a laborer and lived in Cleveland, Ohio in 1941. He married this year with Mrs Anna BUSCH. He was enlisted on April 09, 1943 at Cleveland, Ohio and received ASN 35058579. Private BALLOW was probably immediately sent to Camp McKall, North Carolina for basic training and assigned to the HQ2 Company of the 194th GIR of the new 17th Airborne Division. Daniel BALLOW was severely wounded in action on January 04, 1945 during the first combat of his regiment, in the area of Rechimont, Belgium. He died on January 05. His body returned stateside on December 1948 and he is buried now in New Albany National Cemetery, 1943 Ekin Avenue, New Albany, Floyd County, Indiana. - Private William BALLOW, 24 yrs-old died in November 1944 in France. 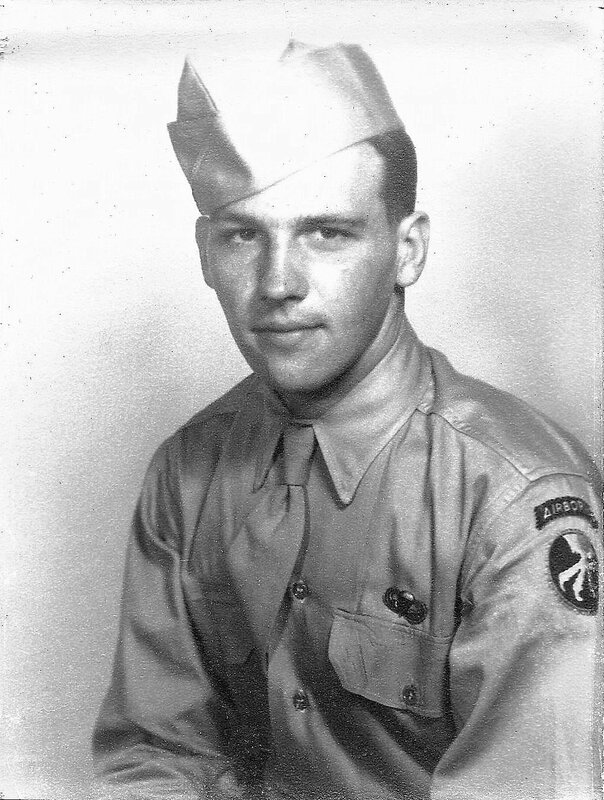 - Private First Class Paul BALLOW, 20 yrs-old died in May 11, 1945 at Okinawa. John W LEATHER circa 1943 or early 1944. John William Leather was born in Beaver Creek, Maryland on November 23, 1924. He was inducted in the Army at Baltimore, Maryland on April 03, 1943 at the age of 19 yrs-old and received Army Serial Number 33719192. 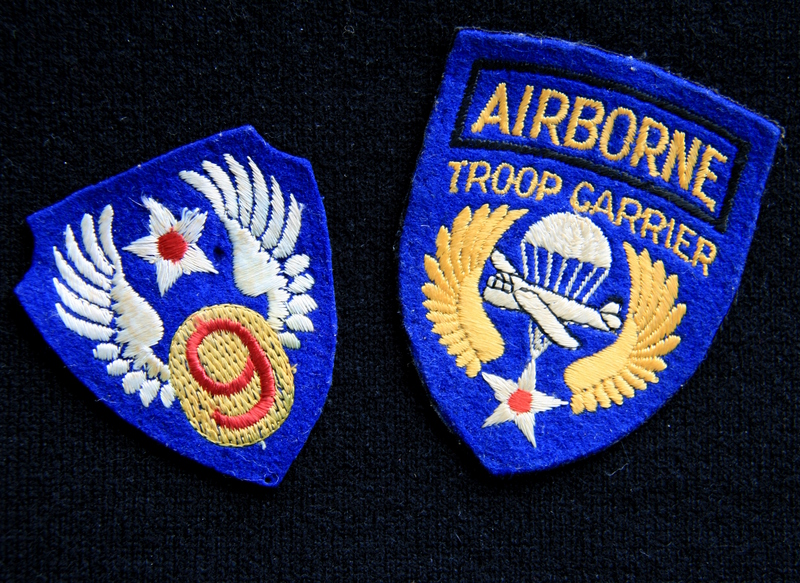 He was send to Camp MacKall, North Carolina where he joined the new Airborne Corps. He was assigned to the 1st Squad, 1st Platoon of F Company, 194th Glider Infantry Regiment, 17th Airborne Division. He was promoted Corporal while he was stationed at Camp Forrest, TN in spring or summer 1944. 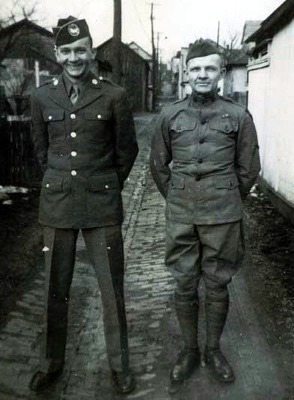 He followed the 17th Airborne Division in England in summer 1944 and took part of the Battle of the Bulge when, on December 24, he was transferred by plane to Mourmelon, France, and then by truck near Sedan with the mission to defend the west bank of the Meuse River. On January 3, 1945, John and his buddies moved forward to the front line. 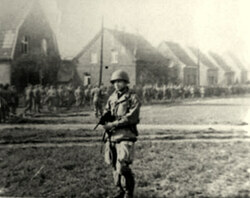 He arrived in Morhet’s station, Belgium before walking closed to the front line near the village of Pinsamont. He received his baptism of fire in the morning of January 4, when his Regiment was engaged in the Battle of « Dead man ridge » with the mission to capture Hill 460 located west of Renuamont. This first battle again the men of the famous Fuhrer Begleit Brigade was fierce and casualties heavy. The regiment was obliged to retreat at the end of the day. The 17th Airborne launched a second major attack on January 7 and once again, the 194th GIR was involved. During this action, John took command of his squad at Rechrival, after his squad Sergeant was killed in action. On January 12, after the general retreat of the German troops, the regiment started a pursuit throw the Ardennes that leaded it to Gives, Bertogne, Compogne, Mabompré, Tavigny and Limerlée. It crossed the Great Dutchy of Luxembourg border on January 22 at Hautbellain. On January 27, John was transported to Pintsch where he remained in divisional reserve. From February 5 to 10, he carried out patrols on the west bank of the Our River to sound the German defences. The 194th GIR was finally relieved on February 10 and John arrived at Mourmelon, France on February 11 evening to take rest, reorganize and prepare the last Airborne operation of WW2 : « Varsity ». It is during this time he was promoted Staff Sergeant. 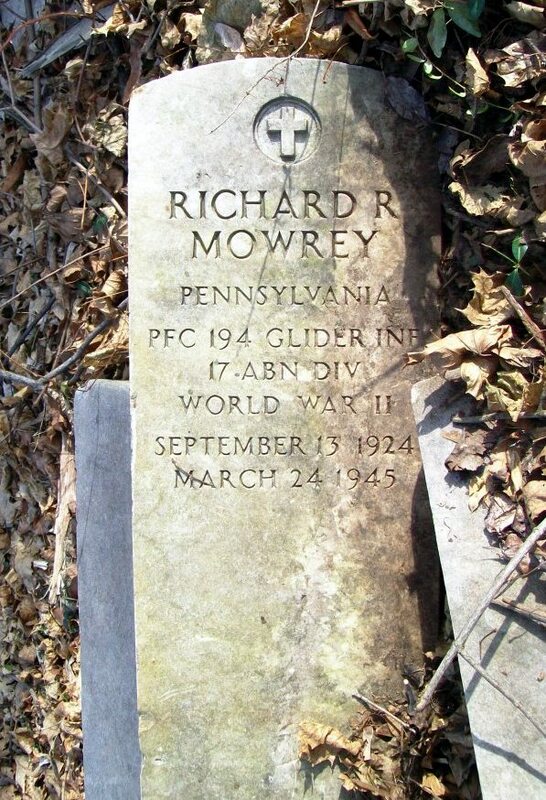 On Sunday March 24, 1945, the glider carrying him took off from Coulommiers – Voisin (US Airport A-58) and landed northeast of Wesel, Germany after a quiet fly. 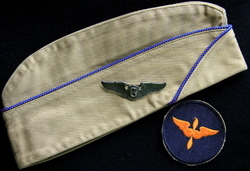 The objective of the Airborne troops was to establish and secure a bridgehead on the east bank of the Rhine river prior its crossing by the Allied ground troops (Operation Plunder). It is during the first invasion’s day he was wounded in foot by a piece of shrapnel. He was evacuated to the rear and send to the 28th General Hospital located in Liege, Belgium. In early May, after a short convalescence, he returned in his company now located in Essen, Germany. At this time, the war was nearly to the end and the mission of the glidermen consisted to retrieve prohibited weapons. After the VE Day, the 17th Airborne remained in occupation. In July, it was transferred to Lunéville, France. John was transferred to the 13th Airborne Division and then sended in Le Havre, where a ship brought him back to New York on August 22. The Japanese surrender avoided him new battles with the 515th PIR where he was attached. John was finally discharged on November, 19 1945. 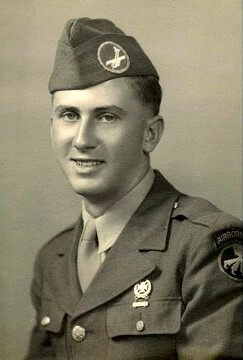 Staff Sergeant John W Leather was awarded Glider qualification Badge, Parachutist qualification Badge, Combat Infantryman's Badge, Bronze Star Medal, Purple Heart Medal, Good Conduct Medal, American Theater Medal, European - African - Middle Eastern Theater Medal with one Bronze Arrowhead and three Bronze Stars, Victory Medal, Occupation Medal and Distinguished Unit Citation. These two pics were realized in July 2001 when John returned in Europe with the 17th Airborne Association. 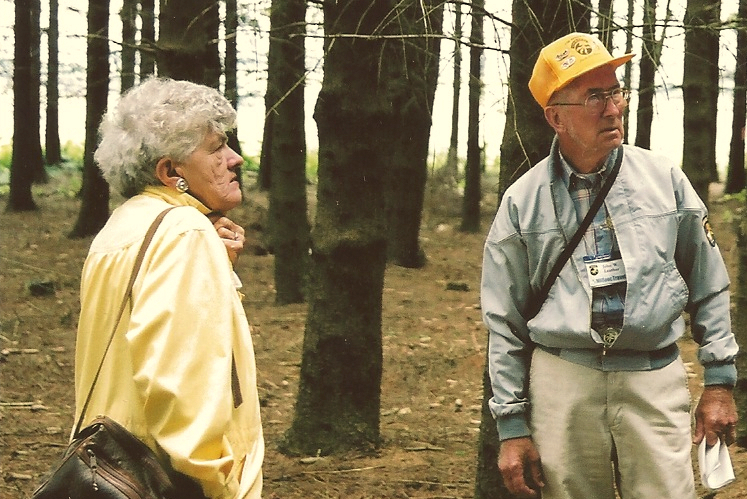 Upstairs, John is in Hemroulle's wood (on E Co / 193rd GIR positions in January 06, 1945) with Helen Canfield (wife of Donald Canfield E Co / 193rd GIR). Downstairs with Anne Telesca (daughter of Lt Leslie Telesca E Co / 193rd GIR who was killed in action on January 07, 1945) and Anne daughter (TFH collection). These photo was realized in March 2014 when John returned in Europe with the help of the 101st Airborne friendly Association. It is the last time I have meet him (TFH collection). He passed away on November 10, 2014. I have had the chance to meet him several times since 2001. He was a friend and I am proud now to honorate his memory in this tribute. Son of Homer Smith LONG Sr and Bessie Leona MOTTER-LONG, Homer S LONG Jr was born on February 03, 1925 in Kane, Pennsylvania. He lived at Bradford, PA and was employed by the Pepsi Cola Co, Olean, NY when he was enlisted on April 07, 1943 at Buffalo, NY. 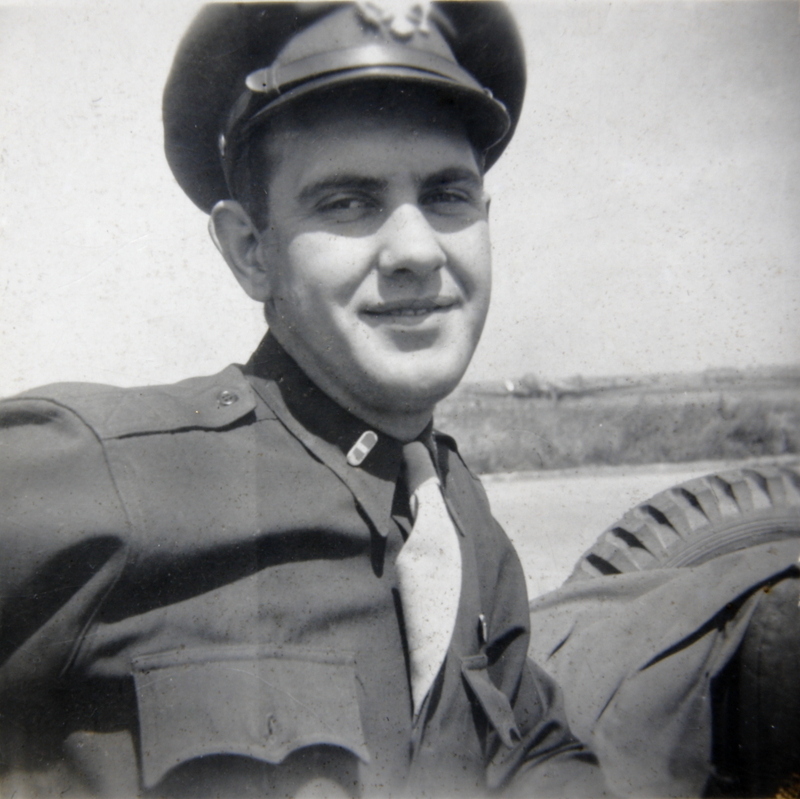 He received ASN 32930595 and was immediately sent to Camp McKall, North Carolina for basic training and assigned to Company F/193rd GIR of the new 17th Airborne Division. 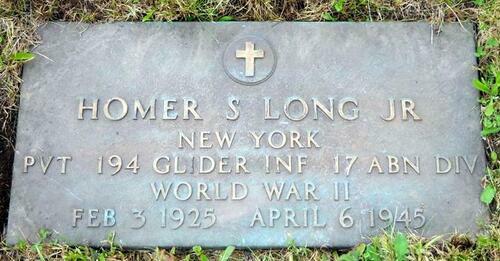 Homer LONG was sent in ETO with his unit, fought in the Bulge and during the Rhineland campaigns. He was part of Varsity on March 24, 1945 before being killed in action on April 06, 1945 in the area of Hamm while his regiment was involved in the Rhur pocket battle, attached to the 95th Infantry Division. He was buried at Margraten US Military Cemetery, Holland before being repatriated on December 03, 1948 and permanently buried at McKean Memorial Park Cemetery, Lafayette, Pennsylvania. 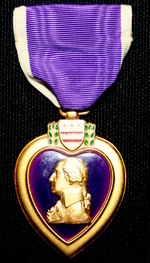 Homer S LONG Jr was awarded Good Conduct Medal, Expert Rifleman, Glider qualification Badge, Paratrooper qualification badge, Combat Infantry Badge, European - African - Middle Eastern Campaign Medal with three Battle Stars (for Ardennes, Rhineland and Central Europe campaigns) and one Arrowhead (for operation Varsity) and Purple Heart Medal (posthumously). This "GI's Tribute" has been realized with the help of Sally LONG SENNETT (niece). John J O'MALLEY was born on 1915. He entered the service from Philadelphia, Pennsylvania on April 01, 1943 and received ASN 33597580 and was finally assigned to the 194th GIR. He died of wounds on January 12, 1945. 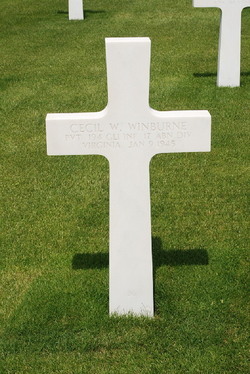 Cecil W WINBURN entered the service from Virginia, circa 1940 and received ASN 6882691. He was finally assigned to the 194th GIR. He died on January 9, 1945 after being wounded on January 04 while he crossed the river "Rau de L'aval" during the assault on Hill 460. 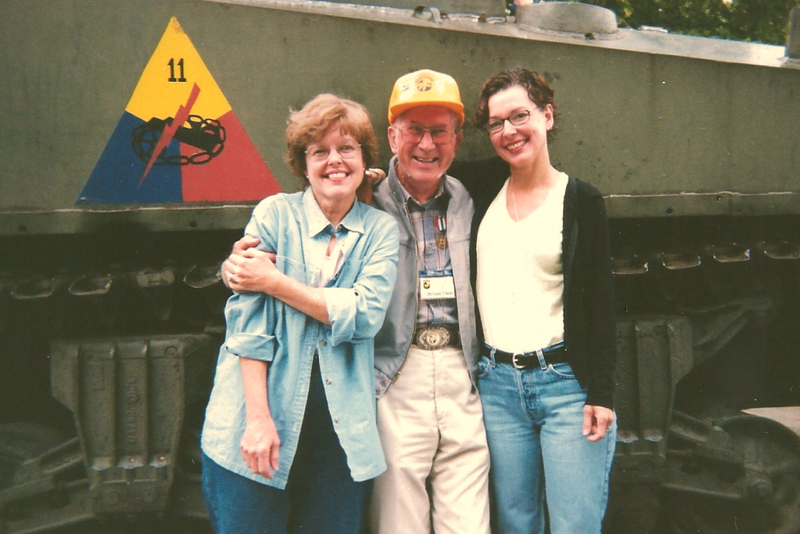 Elmer L WHITMIRE in Amiens, France after the VE Day (with courtesy of Patricia and Bruce OVERMAN). Elmer L WHITMIRE (ASN 32932493 then later T6558) was C-47 pilot in the USAAF. 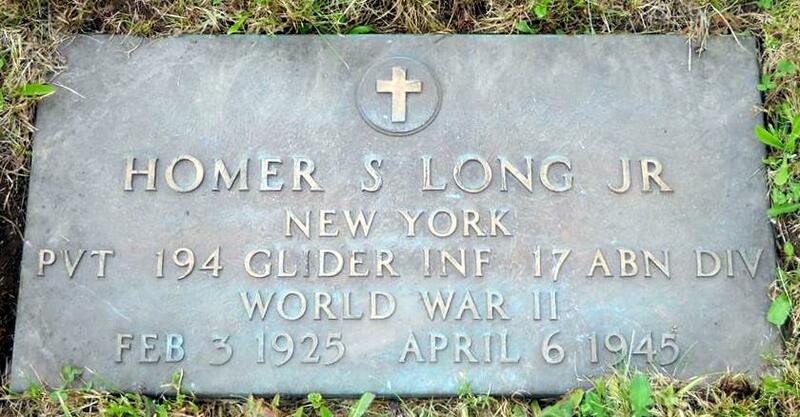 He joined glider pilot school of Laurinburg-Maxton Air Base and qualified as a glider pilot in October 1944. He arrived at Greenham Common Air Base in November 17, 1944 and was assigned to the 88th TCS, 438th TCG, 53rd TCW, 9th TCC, IXth Air Force under the command of Major Robert W GATES. 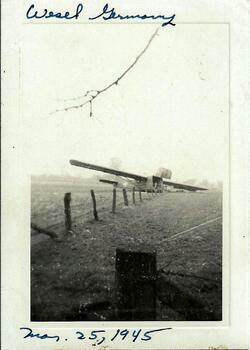 He was a part of the air supply mission over Bastogne in December 1944 and made missions over the famous city. He was transferred to the 78th TCS, 435th TCG on March 21, 1945 at the Airbase of Bretigny, France (advanced airport A48) in preparation for operation Varsity. C47 airplane from the 78th TCS, 435th TCG photographed by Carl AREND (681st GFAB) prior to Varsity ( original unpublished photo - TFH collection). It is at this time his destiny will meet the history of the 17th Airborne Division. 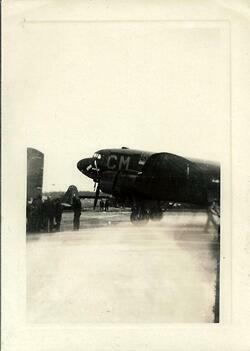 Indeed, on March 24, 1945, Lee finally took off as co-pilot of Waco CG4 glider number 134 piloted by FO Otis COOK. There was also on board Lt Colonel Joseph KEATING, CO of the 681st GFAB, Major Rex Light, S3 and Pfc Harold SNYDER with his jeep. The glider arrived over the landing zone at 12h15. It landed on rapidly to avoid the German flak, approximately one mile from the right place and very closed to the house located Schmitthauskamp n°1. The crew discharged rapidly under MG and small arms fire. 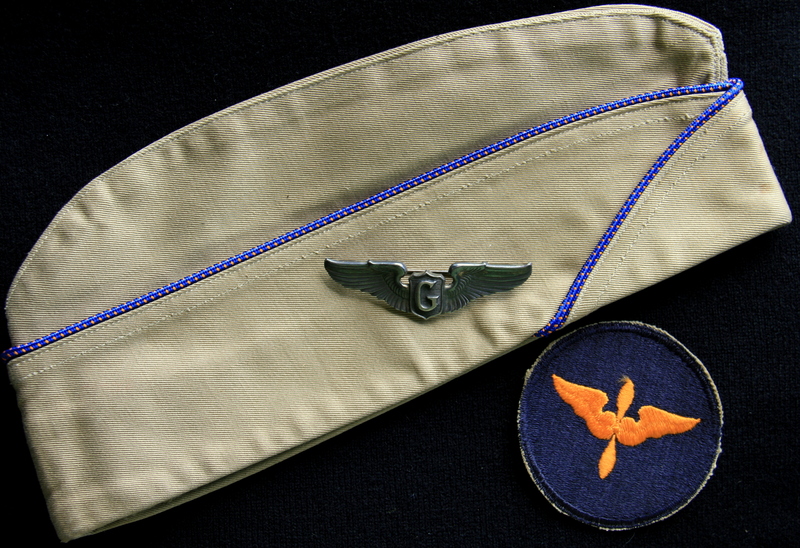 The two pilots stayed with Lt-colonel KEATING and survey section to join the 194th GIR CP. The group encountered intense enemy activity and arrived at the CP around 20h00. Almost all men arrived in the CP with the exception of Lt MURPHY, leader of the survey section and Captain Katsumi NAKADATE, battalion surgeon who were wounded early after the landing. They were left near the gliders. On right : original pic from a glider after the landing, in the area of the 681st GFAB (unpublished photo - TFH collection). Once arrived at the CP, the pilots were assembled in an infantry company attached to the 194th GIR. Lee was member of the 5th squad, 4th platoon of the 435th Glider Combat Team commanded by 1st Lt Earl DAVIS. During the night, German troops launched an attack on the Combat Team lines with approximately 200 soldiers supported by one tank, one self-propelled gun and two 20mm guns. 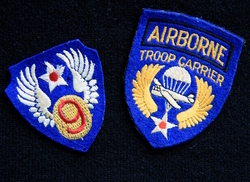 The Air Force soldiers repulsed the assailants and took many prisoners in a battle that became famous under the name of “Burp Gun Corner Battle”. This kind of action remains unique in the history of the Air Force. 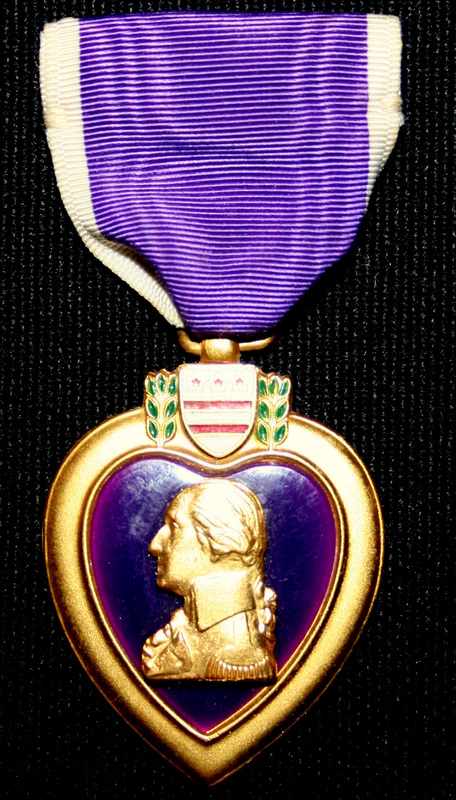 Lee received the Bronze Star Medal for this action. Lee returned in his unit, the 88th TCS on April 20. The group was located at the airport A79 in Prosnes, France. It moved to Amiens, France on May 03 and later to Hannau, Germany (in September) as occupation force. On left : this USAAF trooper is photographed at Burp Gun Corner, just after the battle (web source). Lee was decorated with the Air Medal with Oak Leaf Cluster and the Bronze Star Medal, he received a citation for Ardennes, Alsace and Rhineland campaign. He was credited with four combat missions and three campaigns (Ardennes, Rhineland and Central Europe). He passed away in 1973. This Tribute is realized to honor and preserve the memory of Lee and all his buddies with the help and kindness of Patricia and Bruce OVERMAN (Lee's daughter). N.B. : the pics and items are not belonging of Lee, they are just use for illustration ! They are property of TFH collection except mention. Click to enlarge the pics.